Jacob Berzelius was one of the founders of modern chemistry. He was the first person to measure accurate atomic weights for the elements, which helped to confirm Dalton’s Atomic Theory and was the basis of Mendeleev’s periodic table. He discovered three chemical elements: cerium, thorium, and selenium, and devised the modern method by which one or two letters are used to symbolize the elements. He identified and named the phenomenon of catalysis, and described how chemical bonds can form by electrostatic attraction – nowadays called ionic bonding. Jöns Jacob Berzelius was born on August 20, 1779 in the parish of Väversunda, in Sweden’s East Gotland province. His mother was Elizabeth Dorothea Sjösteen and his father was Samuel Berzelius, a high school teacher. Jacob’s parents both came from church pastors’ families. Jacob’s father died when Jacob was four years old. Two years later, his mother married a pastor by the name of Anders Eckmarck, who taught Jacob about the natural world and how to read and write. Sadly, Jacob’s mother died when he was nine years old, leaving Anders to look after Jacob and seven other children. In 1791, when Jacob was 12, his stepfather remarried. Jacob moved to live with his uncle Magnus Sjösteen. Sjösteen’s wife was an alcoholic, struggling to raise her own seven children. Jacob kept out of her way as much as possible, spending his time outside the house. In spring 1793, when Jacob was 13, he started at the Cathedral School in Linköping, where he tutored wealthy pupils to get money to pay his boarding fees. He paid little attention to the school’s requirements of learning about the Church, devoting his time to the outdoors, where he enjoyed hunting, and became an enthusiastic insect collector. During vacations, Jacob worked on farms, tutoring the children and doing physical labor, growing very strong. He slept in storage rooms. Life was not easy. Berzelius had been a bit of a slacker at school. Nevertheless, he was clearly intelligent and keenly interested in the natural sciences. The local Bishop wrote a letter to Uppsala University, recommending Berzelius be accepted as a student. Berzelius chose to study medicine at Uppsala because it matched his interests, and it offered him a path to financial security. He enrolled in 1797, but ran out of money and abandoned his studies. He resumed in the fall of 1798, age 19, after winning a three-year scholarship. When Alessandro Volta invented the electric battery in 1800, Berzelius quickly constructed one for his own enjoyment. He graduated as a physician in 1802, with a doctoral thesis examining the effects of electricity on human conditions including varicose ulcers and paralysis. Although Berzelius was now a man of medicine, his heart pulled him in the direction of chemistry. He worked without pay helping one of the university’s pharmacy professors. He learned the skills of glassblowing, which later in his career allowed him to prepare precisely the glass apparatus he needed in all his experiments. In exchange for meals, he became a mineral water analyst for Wilhelm Hisinger, a mine owner. Together, between 1803-1805, Berzelius and Hisinger carried out some of the earliest experiments with batteries, splitting salts dissolved in water into more elementary components, with acids going to one electric pole, while alkalis went to the opposite pole. In 1806, Humphry Davy discovered and isolated a number of new chemical elements, including potassium and sodium, using batteries to split dry salts into their components. Davy and Berzelius enjoyed a fruitful exchange of letters about their work. In 1803, Berzelius and Hisinger analyzed a rather uncommon mineral of tungsten and discovered it contained a previously unknown metallic element. They decided to call the new element cerium, in honor of the dwarf planet Ceres, which Giuseppe Piazzi had discovered in January 1801. Despite his discovery, Berzelius’s only source of income in those times was a very poor salary as a physician. He guaranteed a loan for a friend in financial difficulty, who then went bankrupt, leaving Berzelius with so little money that he could barely afford to eat; his friends became worried about his emaciated appearance. In 1807, age 28, Berzelius was appointed Professor of Chemistry at the Karolinska Institute, a medical university in Stockholm. In 1808, Berzelius discovered that lactic acid, previously discovered in milk, is also present in muscle tissue. Later he discovered lactic acid exists as two optical isomers. In 1808, John Dalton published what we now call Dalton’s Law in his book A New System of Chemical Philosophy. He explained his belief that matter exists as atoms, stating that atoms of different elements have different masses. Berzelius was doubtful about Dalton’s theory, but recognized how fundamentally important to chemistry it would be if it were true. Dalton’s theory was unproven – the major stumbling block was that Dalton had been unable to measure atomic weights accurately. Berzelius now embarked on a mammoth series of measurements and analyses of chemicals in order to discover the weights of atoms – if atoms existed. He could not measure atomic weights directly, so his idea was to use oxygen ‘atoms’ as a reference to compare the weights of other atoms with. First he worked on gas reactions, and by 1818 had built an accurate table of atomic weights for the elements he could study as gases, vaporizing them if necessary. He then studied reactions of oxygen with metals to deduce the metals’ atomic weights. It was easy to get these wrong, because some metal atoms combine with one oxygen atom, while others combine with two or more oxygen atoms. Utilizing a number of ingenious methods of his own and recent discoveries made by other chemists, such as Dulong and Petit’s Law, and Eilhard Mitscherlich’s discovery of isomorphism, in 1826, Berzelius published a new table of atomic weights. Even from today’s perspective, the accuracy of Berzelius’s atomic weights is impressive. Berzelius’s atomic weights led to a much wider acceptance of Dalton’s atomic theory, and were the basis of Dmitri Mendeleev’s periodic table in 1869. Berzelius’s achievement in determining the atomic weights of the elements was a remarkable tour de force. To achieve it, he had synthesized, then purified, then analyzed over two thousand chemical compounds – often carrying out several repeats at each stage to ensure accuracy. In fact, the task was so formidable that in 1818 Berzelius had a nervous breakdown. His doctor advised him to travel and forget all about his work. Berzelius spent a year in Paris, but spent most of his time there on chemistry. Nevertheless, he made a full recovery. 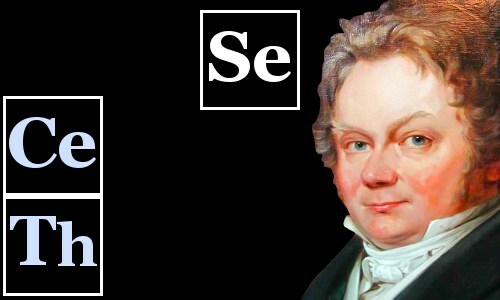 Berzelius discovered thorium in 1815, and, working with Johan Gahn, discovered selenium in 1817. Johan Arfwedson discovered lithium in 1817 while working in Berzelius’s laboratory. In 1824, Berzelius produced the first silicon of sufficient purity to determine its properties. When they wrote about their work, scientists had been using a large variety of different names and different pictorial methods to identify elements and compounds. The elements had different names depending on the native language of the scientists involved. There was no consistent approach. ‘Iron’ is ‘Järn’ in Swedish, ‘Eisen’ in German, ‘Fer’ in French, and ‘Ferrum’ in Latin. Berzelius gave it the symbol Fe. ‘Tin’ is ‘Tenn’ in Swedish, ‘Zinn’ in German, ‘Étain’ in French, and ‘Stannum’ in Latin. Berzelius gave it the symbol Sn. ‘Mercury’ is ‘Kvicksilver’ in Swedish, ‘Quecksilber’ in German, ‘Mercure’ in French, and ‘Hydrargyrum’ in Latin. Berzelius gave it the symbol Hg. Catalysts are of overwhelming importance in chemistry. They are substances which are not consumed in a chemical reaction but speed it up. Advanced lifeforms would not exist without organic catalysts in the shape of enzymes. The chemical reactions in industry which make many of the things around us, such as plastics, would not be possible without catalysts. Berzelius discovered and named the phenomenon of catalysis, writing about it in 1835. Today we understand how catalysts act. For example, they may allow molecules to align themselves appropriately to allow a chemical reaction to take place easily. Berzelius’s work with batteries led him to believe chemical bonds were made when a positively charged ion attracted a negatively charged ion through electrostatic attraction. Today we call this type of chemical bond an ionic bond. However, Berzelius did not realize that more than one type of chemical bond could exist, so he could not explain how two identical hydrogen atoms could come together to form a molecule of H2. In fact, this explanation had to wait until 1916, when Gilbert Lewis proposed that atoms could share electrons to form a covalent bond, rather than exchange them to form an ionic bond. Berzelius’s Textbook of Chemistry became famous around the world. It described all that was known about chemistry, and Berzelius updated it regularly. Berzelius received numerous awards and was made a member of Sweden’s nobility by King Karl in 1818. He avoided the social life of the nobility, preferring to talk shop with other scientists. Berzelius married Elisabeth Poppius in 1835. He was 56 and she, the daughter of a government minister, was 24. They had no children. He suffered ill-health in his later years, including gout, which confined him to a wheelchair. He was also plagued by a faltering memory. Some of his health issues probably resulted from a lifetime of working with chemicals. Berzelius worked in a time when chemicals were usually first identified by their taste, and the air in laboratories was often filled with toxic vapors. Jöns Jacob Berzelius died, age 68, on August 7, 1848 in Stockholm, where he was buried in the Solna cemetery. He was survived by his wife Elisabeth. "Jacob Berzelius." Famous Scientists. famousscientists.org. 25 Jan. 2017. Web.